Is the budget tightening, and there is more and more emergency planning to do? Is it becoming increasingly tough to cover all the different emergency planning disciplines, with an every reducing staff? 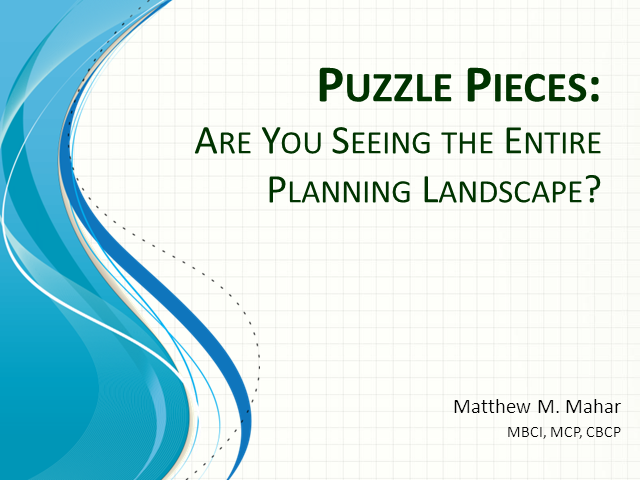 Like putting together the pieces of a puzzle, it is all about finding the right piece to fit into the puzzle, so that you can see the entire planning picture. In a constrained economy, organizations are seeking to streamline their businesses to ensure that they are able to save money, while still accomplishing their mission. A Mission Assurance approach to planning for emergencies is not only critical to ensuring your business is resilient enough to survive an emergency, it’s also a way to streamline your organization and ensure that you are making the best use of the money you are putting into your business. Mission Assurance planning is about bringing together the disparate planning groups, to ensure that planning is cooperative, comprehensive, and integrative. It is about removing the stove pipes of traditional continuity planning, and bringing in a collaborative approach, where all the different aspects have a part to play in the assurance of the organization’s mission.